This cemetery was established in the 1880s. According to the staff, there are no records of any burials before 1891. Records of burials between 1891 and 1915 contain only a limited amount of information. Records after 1915 are much more complete. Most of the earlier burials are Irish, but there are some Portuguese and French as well. 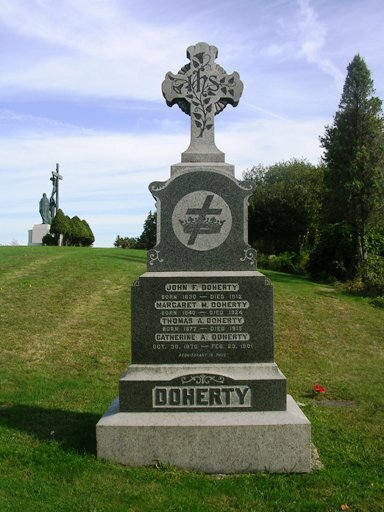 We have only transcribed those stones that are, or likely are, of Irish individuals, and others are included if they were on the same stone. Transcriptions are completed of all existing stones of Irish burials for Plats 1, 2, 2A, 3, 5A, 5, 6, 7 and 8. (11/05) Plat 9 in progress. Catherine D. - Thomas F.
Katie A. - James H.
Henry A. Quirk, Massachusetts Pvt 321 M.C. Batt'n 82 Div. 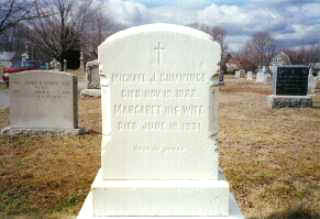 Rita I. Sullivan, 1922-1997, wife of Dr. Eugene F. Jr.
Amy Elizabeth Cummings Died 1896 Age 3 yrs. M.S. Gallagher, Co. G, 37th US Inf. Mary C. Moran, 1906-1982, wife of Thomas J.
Co. C 26th Reg. Mass. Vet. Vols. Late Pastor of St. Andrews Church, Sag Harbor, L.I., N.Y.
John B. Connors, 1847-1880, "Father"
Julia A. Connors, 1846-1909, "Mother"
Mary Ellen, his daughter, Died March 27, 1903, aged 1 year & 6 mos. of the Immaculate Conception, Fall River, Mass. Jeremiah R. Leary, Died Sept. 3, 1998, aged 65 years & 8 mos. Rev. Thomas J. Loughlin, Died Nov. 5, 1900, age 36 years & 10 mos. Agnes T. MacDonald, aged 9 mos. Sarah, his wife, Died July 9, 1901, aged 54 years & 9 mos. James Monaghan, 1840-1917, Co. C 1st R.I. Cav. Willie, their son, Died June 20, 1903. aged 3 years & 2 mos.